Dollar General: $1 for 12 cans of Libby's vegetables starting 11/22! 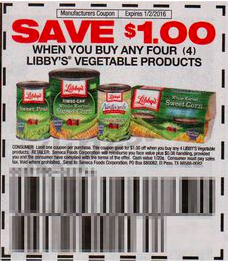 For some of you this Sunday, you will be getting $1/4 Libby's Vegetable coupon in 11/22 Red Plum (regional coupon!). At Dollar General on also starting 11/22, the canned vegetables are 3 for $1! My coupon preview source does not show it being part of RP this week....but a well known coupon clipping service has it on their website! So it is regional, I just don't know which area it is in! Final Price: $1 for all 12 cans!